We offer birth pool hire of the popular La Bassine for your home birth or water birth of your baby. 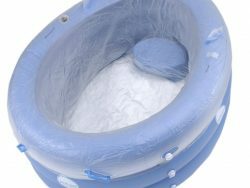 This birthing pool is provided clean and sterilised and is made from a special vinyl that is Eco-friendly and non-toxic. 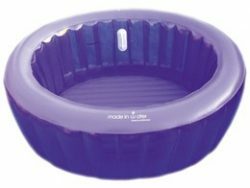 It is slightly smaller than the Birth Pool in a Box Regular & thus easier on your hot water cylinder (comparable to the Birth Pool in a Box MINI pool). It is super sturdy so you can have a support person sit on the side, and extra deep for a wonderful feeling of buoyancy that supports and eases your labour. There are conveniently placed handles on the inside, which gives you extra grip area for changing position or holding onto during second stage. 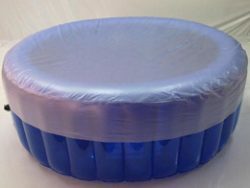 The floor is fully inflatable, so you don’t have to worry about being on your knees for long periods. A birth pool can be used if you are birthing at home or in the hospital/birth centre. You may use a birthing pool during labour at home to deeply relax and encourage contractions, as well as provide excellent natural pain relief for your labour. Being in water may be useful during a stalled labour if this is due to stress or anxiety. At times the change from water to air can be of benefit in getting things to move along. Click here for full specifications of La Bassine Birthing Pool. Your hire includes courier to and from your address (if you are rural there is a local courier drop off point which we will advise for return), but you are also welcome to pick up in Waiuku, Auckland.